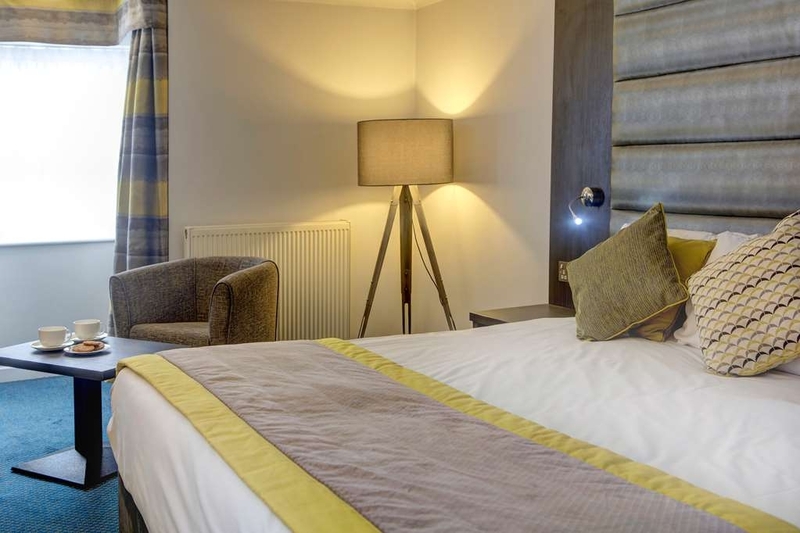 El The Watermill Hotel, Sure Hotel Collection by Best Western se encuentra en el centro de Hemel Hempstead. Venga y disfrute de las mejores atracciónes turísticas cerca de nuestro hotel. Precios bajos garantizados y ofertas exclusivas. 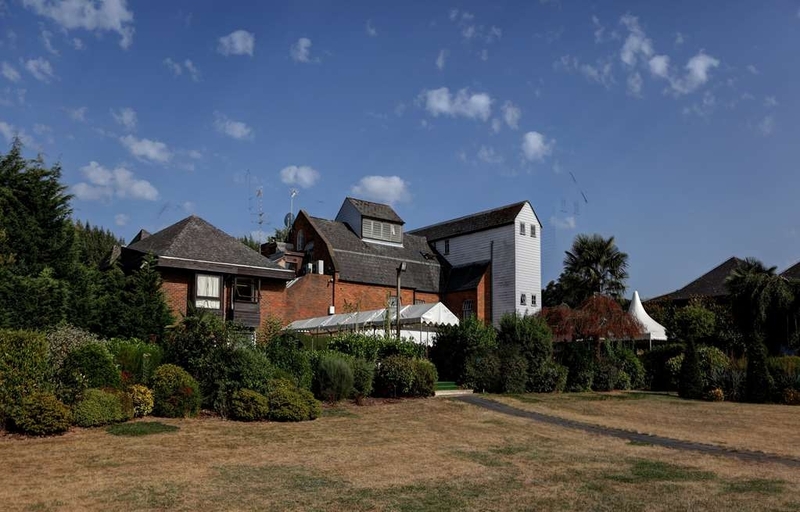 Construido en el emplazamiento de un antiguo molino de harina en las orillas del río Bulbourne y a las afueras de Hemel Hempstead, The Watermill Hotel, Sure Hotel Collection by Best Western ofrece un apacible entorno alejado del ajetreo de la vida urbana. Nuestras 71 habitaciones proporcionan un moderno espacio con una excelente decoración y con todas las comodidades propias del hogar, contando varias de ellas con hermosas vistas a los exuberantes prados y al río. Tanto si se encuentra en viaje de placer como de negocios, aquí encontrará un amplio estacionamiento gratuito y acceso a Internet Wi-Fi en todo el hotel, así como el Riverside Bar and Lounge para desconectar de todo al final del día. 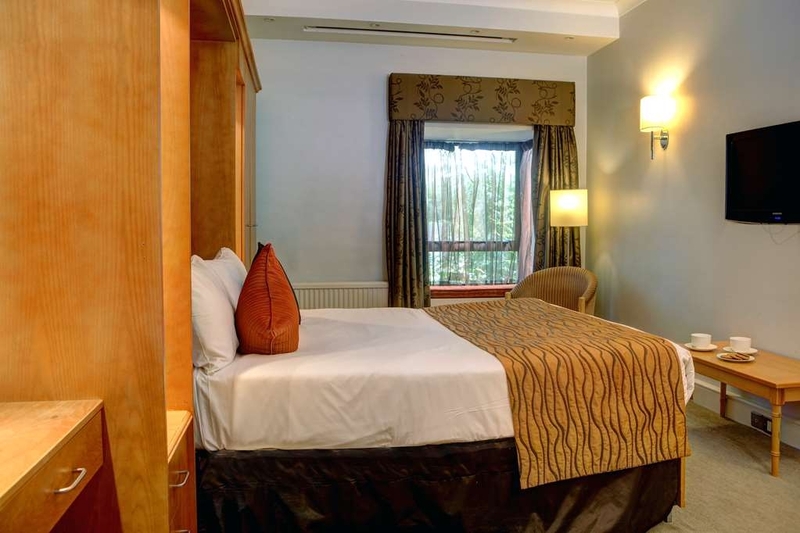 Nuestro hotel se encuentra a poca distancia de Londres y junto a una gran variedad de atracciones de primer nivel, entre las que se incluyen el zoológico de Whipsnade y Woburn Abbey. Los aficionados a Harry Potter podrán seguir las huellas del niño mago en un día repleto de magia en el recorrido por los estudios de la Warner Bros, al tiempo que los entusiastas del esquí y el snowboard podrán visitar las pistas cubiertas del Snow Centre. Excellent value for money. Room amenities all worked well. Instant hot water all the time and really big bath towels. All meals very good freshly cooked. Heating individually controlled. Access to motorway etc. simple. "Excellent venue for Business Meeting"
"Good for a night's B&B"
Modernish hotel but needs updating. Room was comfortable but only had a small window. Breakfast was ok but overcooked. Good for a night's B&B though and fairly close to the A41 & M25. The White Horse Pub over the road was good for lunch. The Hotel hosted my wedding at the end of March. I will struggle to find anything negative to say about the Hotel and the Staff. From the initial booking I felt the staff were very eager to please and were very professional. 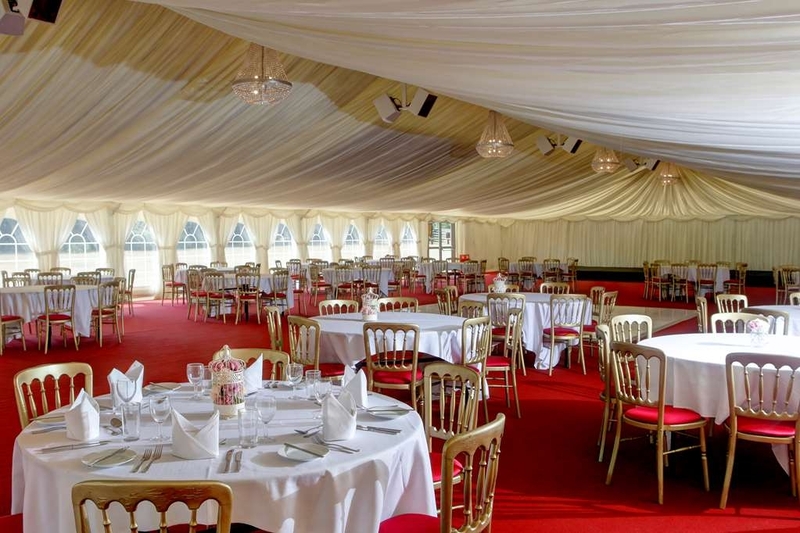 Any requests we made were sorted with no fuss making the planning process simple and stress free. Leading up to our big day the hotel wedding planner “Yasmin” was in regular contact and couldn't have done more. This was her first wedding for the Hotel, that surprised us as she appeared confident and professional and did a superb job on the day. On the day everything went without a issue. 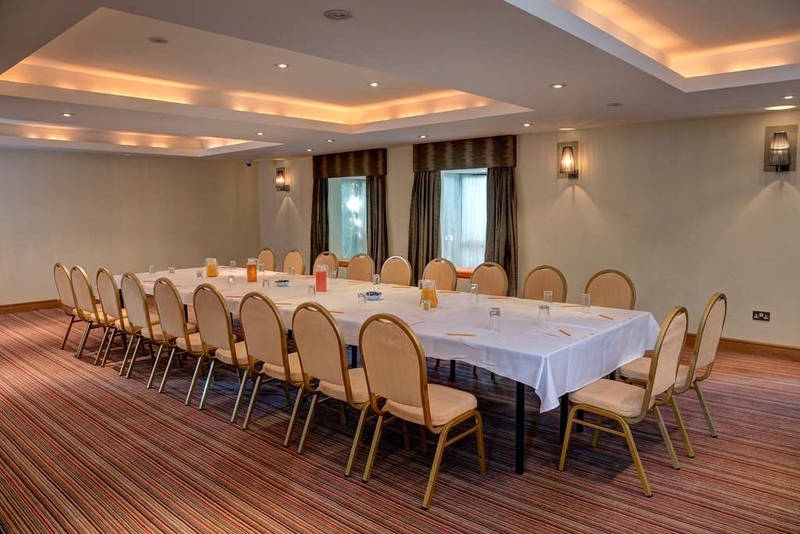 The room was presented beautifully and the staff were excellent. The food was tasty and fresh. The weather was good so gave us the opportunity to have photos taken in the pleasant garden and on the decking area. The duty manager was constantly close by but I didn't need to speak with him as everyone worked well under his pleasant supervision. An example of how accommodating the Hotel were pleased myself and most males there (sorry not being sexist) - the draft Lagers initially available were not to my taste. The Hotel arranged for barrels of my preferred lager to be available on the day. A good move by the Hotel as I'm sure they sold lots. Myself and my wife would recommend the Hotel to anyone wishing to hold their Wedding there. Excellent venue and service. Very polite and friendly staff. We stayed in hotel for 3 nights and it was great! Our room was clean, quite small but for us it was enough. The staff were so professional and friendly. Hotel is few minutes from Hemel, but bus stop is near the hotel. Highly recommend if you are looking for a hotel in the area. Visited for a family wedding held here. Service, staff and food were great and we had a marvellous day. The room however was a little tired- curtains hanging off the rails, room unbelievably hot and possibly the most uncomfortable bed ever. The bed moved side to side, creaked whenever you moved and I swear you could feel every spring. "Basic but served purpose. " Stopped for one night. Would normally have stayed closer into Hemel but hotels booked up and so stayed here which is a quite a bit out of town. Rooms ok, nothing special but served what we wanted. River running outside bedroom window was a pleasant view. Complementary toiletries smelled good also. Didn't stop for breakfast as was eating in Birkhamsted so cannot comment. Hotel undergoing renovations whilst we were there so car park size was restricted. I stayed at the Watemill Hotel for only 1 night in the suite 226. 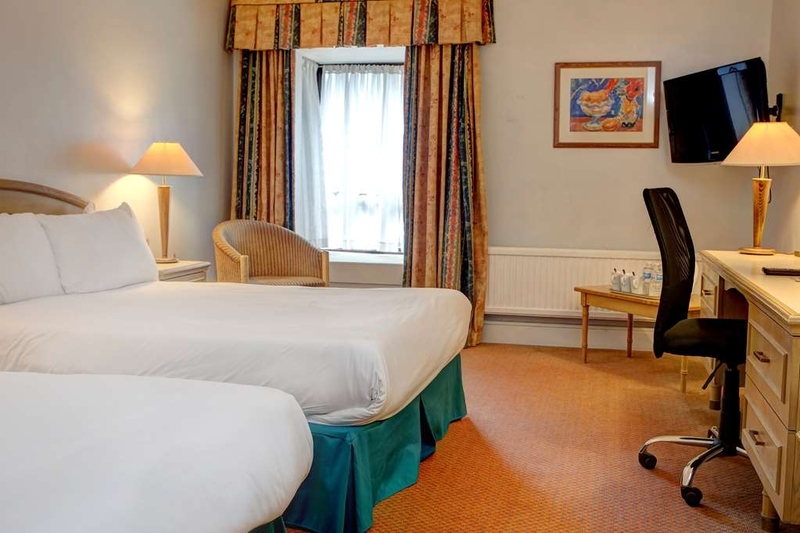 My experience was really good because the facilities were perfect in the room, the bed was very large and very comfortable and the pillows of the bed were very soft. The food presented in the room was also very nice, I enjoyed it myself. The staff is really friendly from the kitchen to the reception. I highly recommend this hotel to anyone. My compliments to the general manager. Thank you very much. Great venue with very helpful staff. Reception staff were efficient and cooperative as well. The management must realise that they need a few more staff as there were not enough to cater all the guests. Food was hot tasty and well presented. Surely a place we would visit again. We met up with some friends from the Midlands and spent a day and a night at this hotel. It is pretty basic and the rooms we were initially offered were rather 'tired'. 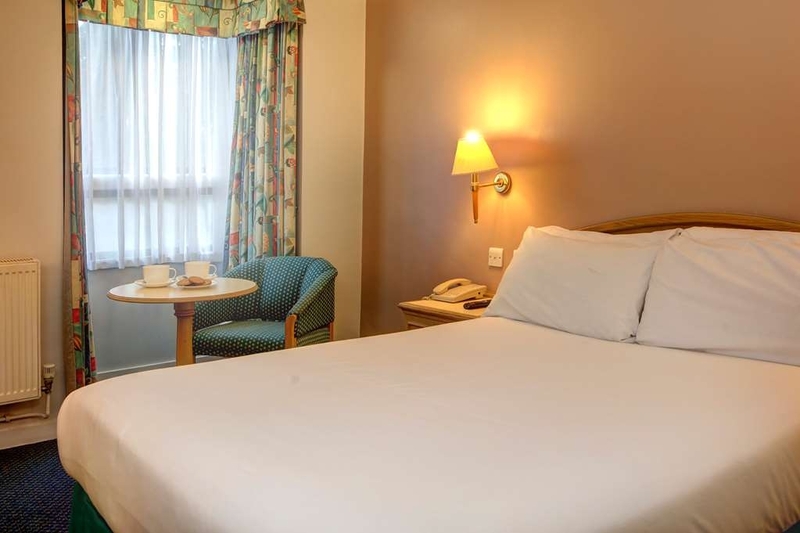 However, when we asked, the receptionist put us into newer and slightly larger rooms which were better decorated. 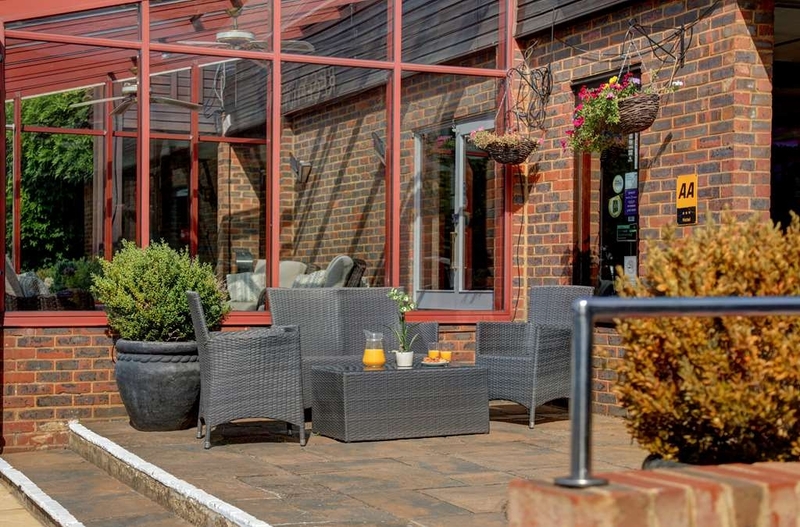 At the front of the hotel is a conservatory which would comfortably seat six people. For us and our friends this was a great place to sit and chat. There was a bar on site which served some food but, during our stay, no-one seemed to be eating in the hotel. Across the road are two pubs which serve good food and there is also another pub close to the canal about 10 minutes walk from the hotel. 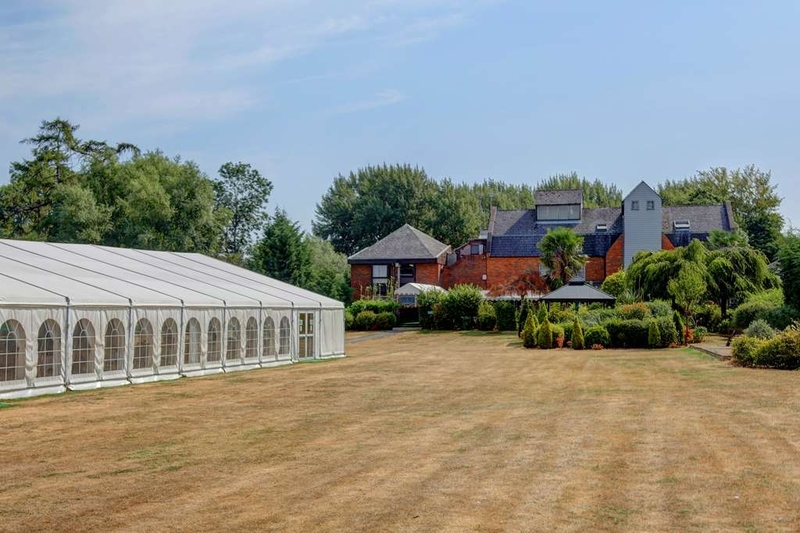 The weather while we were there was wet but in better weather the hotel is set up for wedding receptions in reasonably attractive grounds. Seven of us had afternoon tea here for a special occasion. The scones and sandwiches were fresh and lovely. Very reasonably priced too. Very good and attentive service from the receptionist, Natalia. We would return. I organised a one-day conference for client Flamingo Paperie at the hotel this weekend and the service was second to none. The team was extremely helpful, especially in light of additional numbers of delegates being added at the last minute. 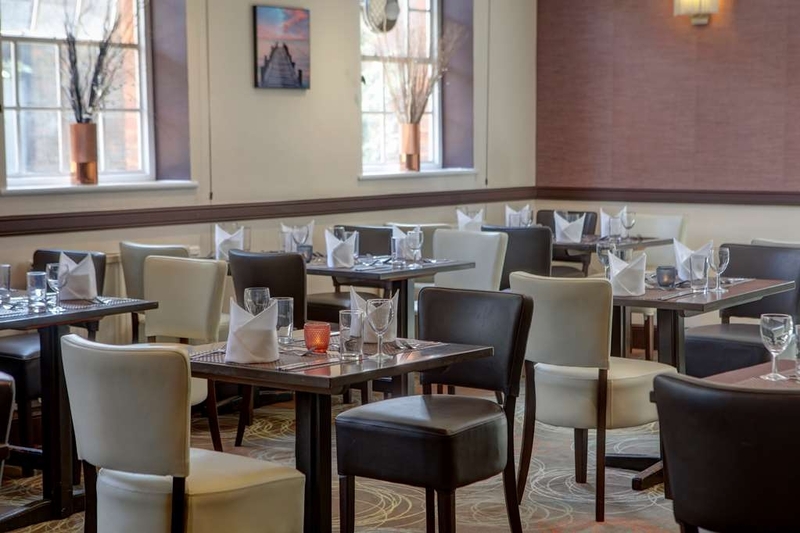 Food was delicious and the hotel was particularly good at ensuring that dietary requirements were carefully adhered to as we had a few delegates with food allergies. Came here for a conference and decided to stay the night before. Check in okay; asked if we wanted to book breakfast explained that we had booked dinner, bed and breakfast. Oh yes, do you want to book for dinner? Same answer. Room was basic but clean, curtain hanging off end of rail and room was cold, managed to turn radiator on and soon warmed up. Towel rail in bathroom was cold and no way to turn it on. Went down for a drink and tried to order a sandwich- sorry chef doesn't come in until 5. (went over the road for lunch instead!) Very confusing information as booklet says food available from 5pm but information about food says cream teas available 7 days a week from 1pm to 5pm! Went down for dinner, where do I start? My husband asked if he could have mash instead of chips with his pork belly, waiter asked the chef and answer was yes. I ordered "Freshly battered fish of the day with Chunky chips", ordered a bottle of wine and he brought it out, waiter started to pour a lovely looking red - pity we had ordered White! Meals arrived (brought out by the chef in his jogging bottoms and wooly hat) with my husbands meal buried under a mountain of chips! Explained he didn't want chips and mash so he took it away and returned without the chips. Fish was NOT FRESHLY battered, it was a measly looking piece of fish which was overcooked, dry and inedible. The chips were also cheap and nasty looking frozen chips which were also overdone, very disappointing. Asked for desert menu and then the waiter came back a few minutes later and said only desert lemon or chocolate cheesecake, asked if ice cream was available? Came back yes! The ice cream was lovely! Retired to our room for the night. Asked at reception about the towel rail not working and was told she could give me an electric heater - not ideal in a bathroom! The bed was "bouncy" to say the least. It was like being in a hammock on a boat! It literally rocked from side to side if either of us moved during the night! Sign in bathroom says not drinking water so had to use the bottled water for a cup of tea! Headed down for breakfast, got pounced on before we had even sat down "do you want breakfast?" asked what was available, "sausage, bacon beans, English breakfast." Ordered two full English, one without beans (told him this three times) and yep it arrived with beans. I explained that one should have no beans and waiter looked shocked as if I hadn't mentioned it before! Checked out and headed for the conference. This hotel is clearly geared towards this type of event. Conference was great and wondered what lunch would be like given our experience to date! What a shock, hot and delicious. Choice of chicken in gravy or beef stroganoff with rice, vegetables, new potatoes and salad. Amazing how they can feed 120+ people in the space of an hour but fail so miserably with just two guests in the restaurant. Staff were pleasant and friendly but didn't always seem to understand questions. I would consider staying here again but wouldn't bother with dinner, just walk across the road to the pub! Our room backed onto the river, so no road noise just the sound of the water. 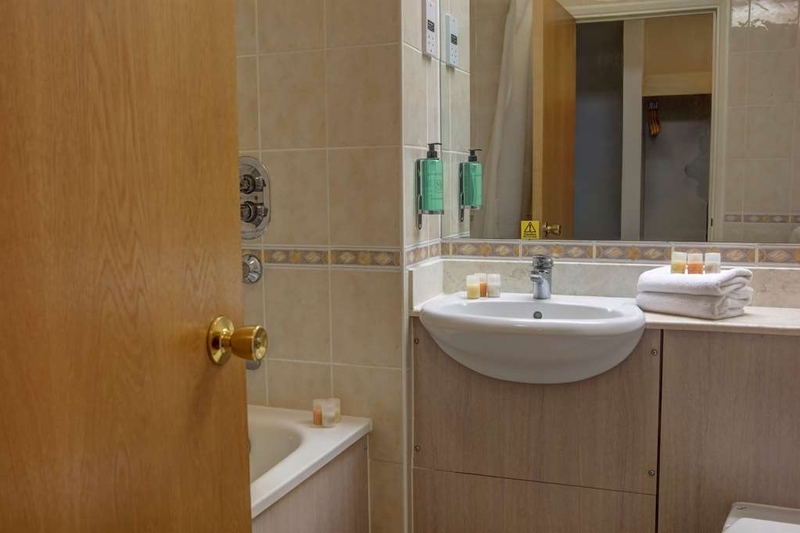 "Good value clean hotel but lacks atmosphere." We went to this New Year's event two years ago as well, it was a great night out then, but now it has even improved even further. The food was very good, well prepared and served hot and tasty. Table decoration was excellent, and the room also nicely decorated, free glass of prosecco on arrival and at midnight and the drinks on the evening were very well priced, especially the wine. Easy parking, friendly staff, a good disco and it seemed all enjoyed the night. The new management certainly tried hard to deliver and succeeded at a very good value price; we will be going again. We stayed one night at this hotel when visiting family in the area. The staff were friendly and helpful when required. The room was clean although could do with some TLC (end of the curtain was off the rail) but overall we were satisfied and would stay here again. 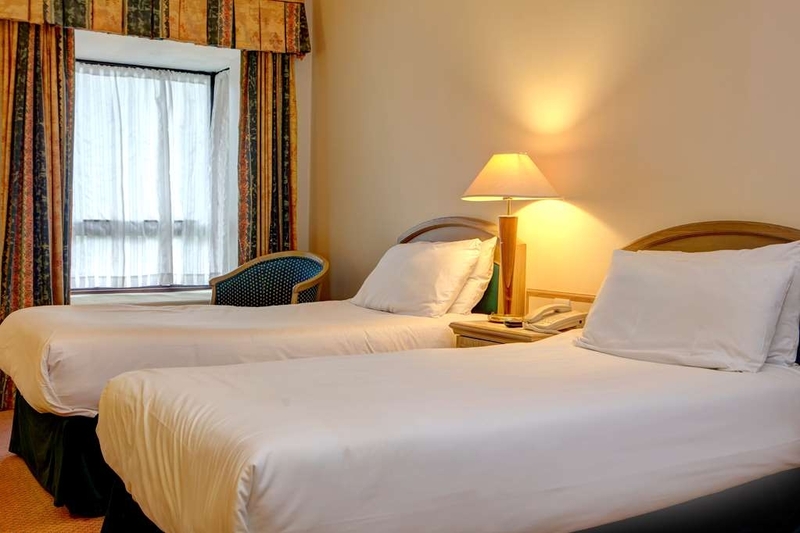 "Good hotel for business traveller"
Comfortable, clean room, comfortable bed. Despite being on a main road it was very quiet and peaceful thus ensuring a good nights sleep. A good breakfast to set you on your way. Whilst not a 'Buffet' breakfast the service was quick. It is nice to sit outside in the summer and the bar/restaurant area is cosy in winter. Stayed for 1 night while visiting Harry Potter world. Had room service as my daughter wasn't very well and it take a long time to come but when it did it was very nice. Ciril who fetched our food was very friendly. Took a party of 35 people to there Christmas Party Night, with not one negative comment. Staff, amenities and venue all very good. Food very good and bar facilities more than adequate. 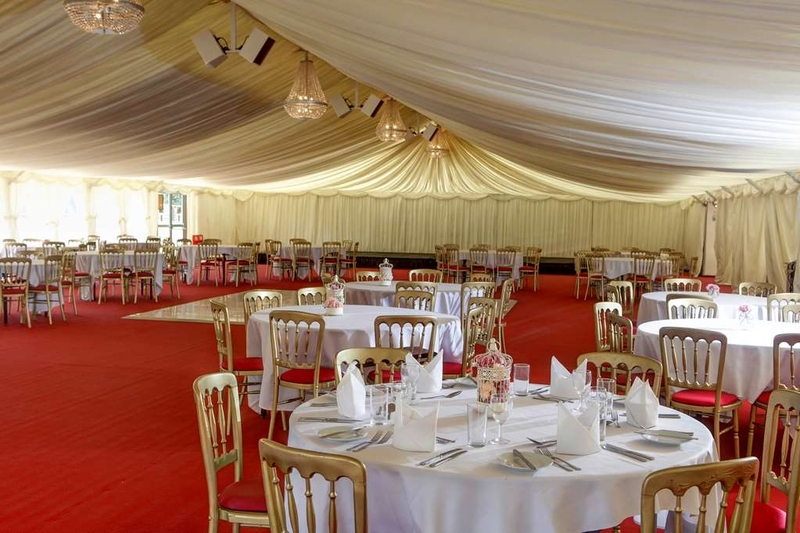 If you are thinking of off a venue I recommend this one. "One night at the Watermill Hotel"
This hotel has an interesting layout, a main building with reception, restaurant and bar plus some rooms and then several 2 storey outside buildings - no lifts and no covered walkway from the main reception to the outside buildings so not so nice in the rain or if you have lots of luggage! I was in a spacious non smoking twin room at the very end of a 2nd floor corridor in one of the outer buildings so it was very quiet and comfortable but the room definitely smelt of smoke although this could have been in the fabric of the room and from long ago. The bathroom had a full size bath with a shower over it so check facilities if you have mobility problems and need a walk in shower. Plenty of car parking available at the front of the hotel and outside each of the out buildings. Arrived in the dark and left in the dark so I didn't get to see the grounds or the river which I believe are a feature. Wish I'd checked the reviews before booking a room here for two nights to attend a family wedding being held there. Hotel looked lovely but the warning signs were there at check in when the receptionist had problems activating the room keys. We settled into our room which at first glance looked okay until that is we decided to have a sleep in the afternoon (we'd been travelling since 5.00am). When my husband turned over the bed collapsed! On closer inspection one of the legs had sheared off and had been crudely repaired! When we reported this we were immediately given another room but it was obvious the staff were aware of the problem. The new room was certainly bigger than the previous one but after a horrendous night with little sleep and sore backs in the morning we weren't looking forward to a second night there. Things got worse when we went for breakfast. We were asked if we wanted a cooked breakfast to which we said yes but after my husband had finished his cereal. He was half way through his cereal when the said cooked breakfast was plonked down in front of us without us even being asked what we wanted to eat. At this point we decided enough was enough and we managed to get booked into a nearby Premier Inn. 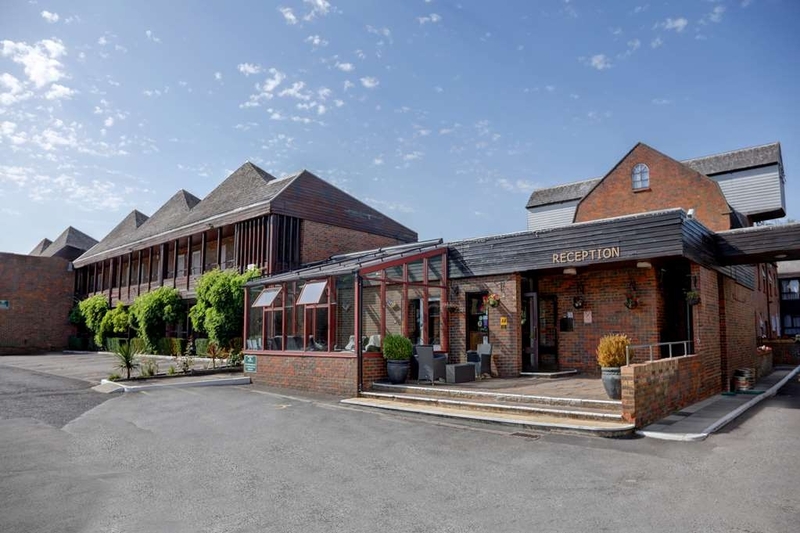 It's such a shame that it's run in such a shambolic way as there's so much potential there but it certainly doesn't deserve either the three AA stars or to be part of the Best Western hotel group. The staff don't have a clue about how to run a hotel or customer care. Avoid at all cost!! "Sunday Afternoon Tea for relatives and friends"
I organised this as a surprise get together for my Father. Everything went really well and I would recommend the venue for this. The quality and quantities of food were excellent, we had the traditional option. 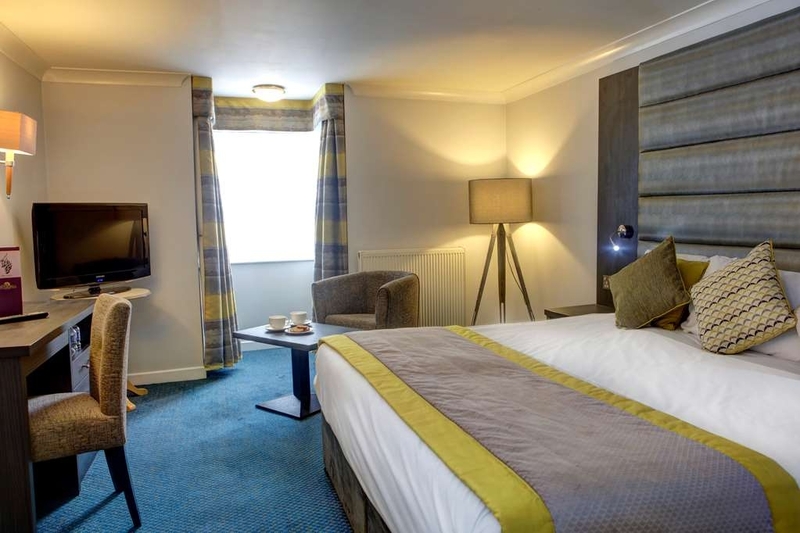 Ensure that all matters relating to the administration of your booking are clear as there were issues around this prior to the event, which were resolved by the manager, but I was very surprised that this happened at a Best Western hotel, and this is why I have stated four not five stars. I would recommend this venue for pre-booked afternoon tea. 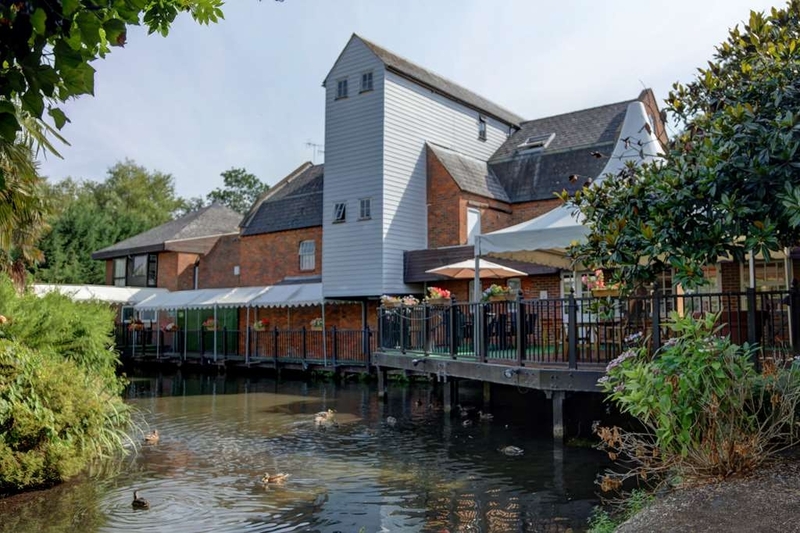 We enjoyed a family party at The Watermill and stayed overnight. 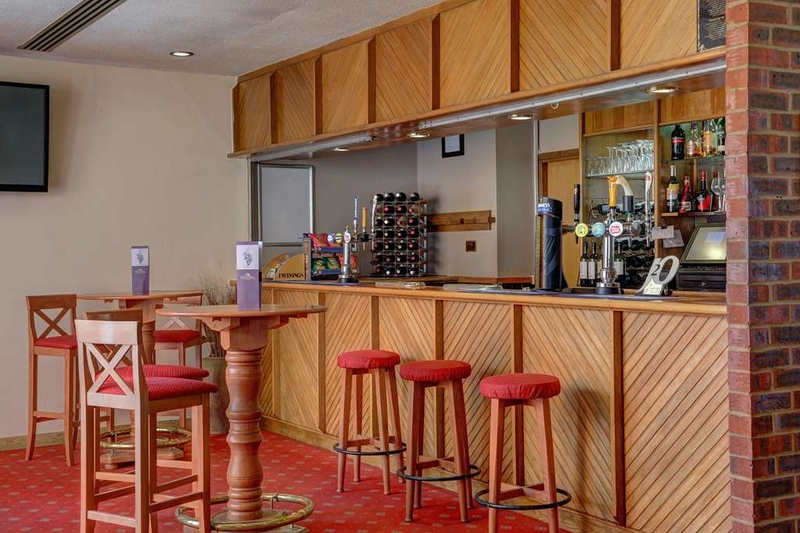 Cyril on reception was very welcoming, polite and efficient and also had to man the bar which he did admirably. The finger buffet food was ample and a really nice (although carb-rich) spread although none suitable for a vegan to eat (from his experience he had brought his own). The function room was perfect. The toilets were nearby but had no soap provision for hand washing in the ladies and was not acted upon when asked to rectify. Not very good for hygiene purposes especially with a finger buffet and there was no soap provided in the room so we had to use the shower gel for hand washing there. The breakfast was nice and a hot buffet provision with a nice selection of tinned fruits and cereals. Self serve toast, pastries and beverages were provided. The room was clean enough although the surfaces were grubby and I found some condoms in the drawer! I tried not to look too closely! The bath towel was stained although looked clean. For the price it was a adequate provision for a nights stay for the purpose of our visit. "2 day weekend conference at the Garden Suite"
This is the first time we have used the Watermill Hotel for a conference. 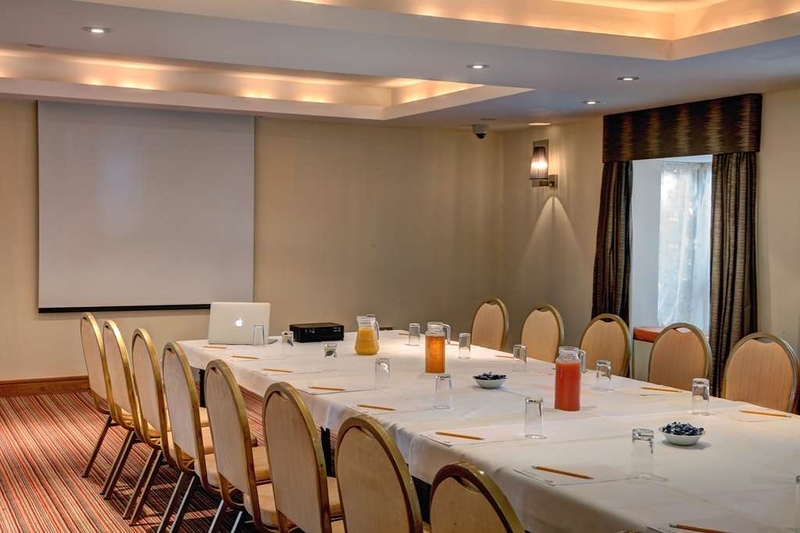 The conference was held in the Garden suite, a large room that can be sectioned off with moveable walls. The staff were excellent - nothing was too much trouble. Particularly Martin, who was on hand at all times, even coming in on his day off (Sunday) to help out. Organisation was a dream and this helped the course run very smoothly. The restaurant catered for a wide variety of special dietary requirement with no fuss. The food was excellent and service again wonderful. Bedrooms were larger than expected and clean. Overall a great experience, value for money and great service. We will definitely be back again. 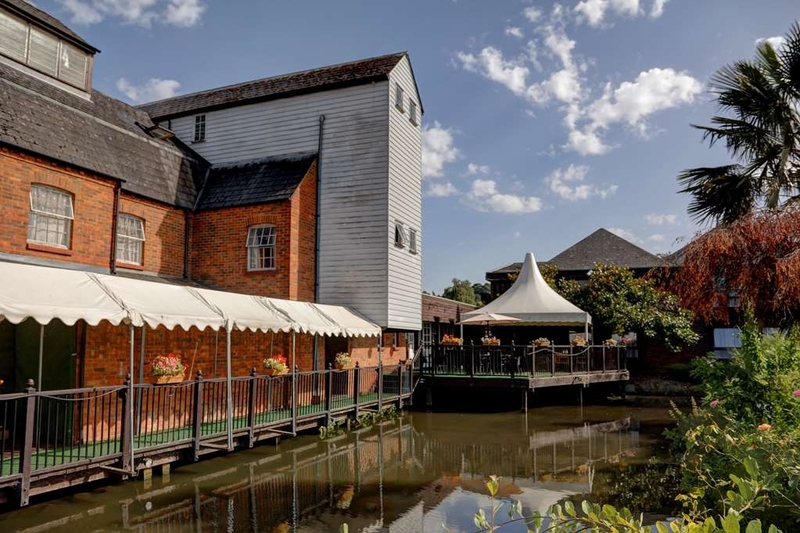 "Day away with an evening stay"
Originally a flour mill with water running all around the hotel. Many of the rooms looked like a motel with rooms opening to a balcony, we were in the annex and a good sized room, but what we noticed more than anything, was how clean everything was. Bed very comfortable and firm, enough complimentary coffee and tea and a decent shower. We only stayed one night and didn't use the rest of site as left early in morning, but thought it was worth a bit of praise, as we think it was the cleanest room we've seen in the last few years. in short. Staff speak very poor English, the bar is terrible, I ordered a Guinness which was like vinegar, then a Boddingtons which was like vinegar plus acid....... CLEAN THE LINES. I did however enjoy watching the rats frolic on the stagnant lake surrounding the rooms and thrilled at the Managers publicly chastising the staff for not having a clue how to serve or even how enter items on the till. the room itself was ok? apart from the er the road for food dripping toilet which was a nice backdrop to the nearby trains.....................Go over the road for food and drinks! Attended a business breakfast event and felt so sorry for the hosts. As a fellow business owner, when you book a hotel for an event you expect a level of service. In fact, ANY level of service would have helped! Breakfast was late and slow, plates ran out, cutlery ran out, tables weren't cleared quickly..... the list goes on. There was no manager on site to help, so everybody was pretty much left to it!!! AVOID!!!! "Good place for family stay"
The location was amazing , had planned a damily trip and everyone enjoyed it. Staff were really good Marteen and cyril they made you feel welcome. Buffet style breakfast was really good.Will surely visit again. 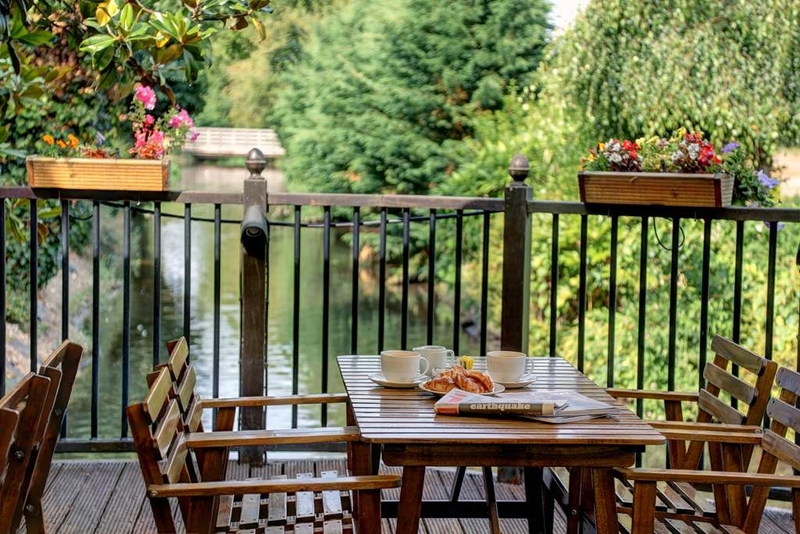 We had a comfortable stay at the Watermill hotel. The front desk staff was very friendly. We were impressed by the room service offered to us by Mr. Pereira. We came across the manager Mr. Fernandes who was very jolly, n fun loving person who made us feel at home. Indeed a pleasure meeting these human. We really had a very pleasant stay. "Nice place and friendly staff"
The breakfast was widespread and delicious and had a good healthy section. The canal was nice and the rooms were exceptionally clean. We had a good experience Very helpful and responsive staff. no air conditioner. 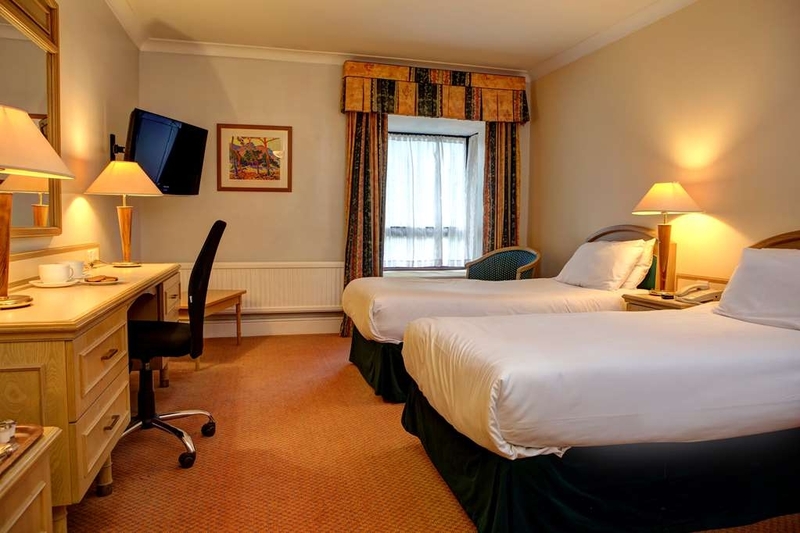 "Nice Location, Beautful view, Comfortable Room and Great Service"
Visited our family in Hemel Hempstead and hence chose to stay here. The rooms were quite comfortable with beautiful view . The staff were quite professional and pleasant. Had a comfortable stay. Tea with sanwiches and scones served in the lounge were freshly made tasted great. 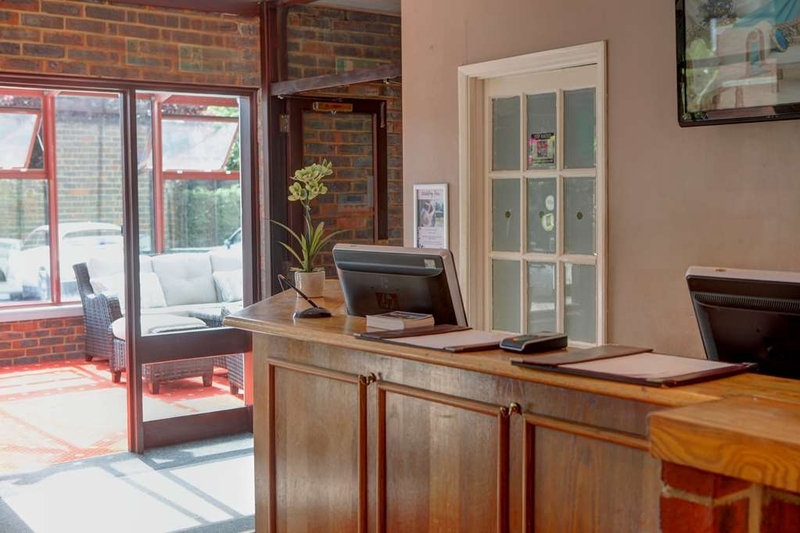 We had a comfortable stay at The Water Mill Hotel and the check-in was very smooth ,we were given excellent room service by Mr Cyril Pereira the staff was very friendly and the manager Mr Martin Fernandes was very interacting and a fun loving person. We had a very pleasant stay. We come away for a few nights and when we arrived to the hotel we was left waiting for ages the staff was very rude and didn't really no any English when we got in the room it was cold and the towels was dirty like they had been left from people before when we told them they said they would bring new and we never got til next day. Then when we went to check out they try saying are payment didn't go thought so we had to pay again which we didn't really have the money so now they have had two lots of money and we have been left overdrawn its a joke had to get police and fraud team involved its taken a lot of my time and effort today and has left me very poorly with my mental health and stuff..
We come away to Hemel to visit family for a little break and stay at this hotel when we went to check out it didn't go smoothly they said my partners card declined even tho we rang the bank it never so we had to pay on my card which was last of my money for a week to buy milk, nappies and they told me they would put the money back in and to much of are surprise were still waiting and been on phone all day to them and back which has been really stressful and I don't need it, I have a new born baby so need time for him and haven't been able to do this so really upset and angry about this, So we're 140 pound overdrawn so any child benefit I get is gonna come straight out we have now and haven't got a lot of money anyway. Which now the police and fraud team are trying to sort out but until then we're without money. The staff are very rude and couldn't understand me and keep hanging up to be honest it's been a joke... Wouldn't recommend this hotel at all !!! Went for afternoon tea again as had enjoyed it so much the time before. Tea was made strong, just how we asked for it, sandwiches were beautifully fresh, and the cakes were delicious. There was masses of cream with the scones and the scones were the best we have ever tasted. We asked if they were made in house and were told yes they were made fresh by the chef. Absolutely delicious! When we arrived in our room the curtains were hanging off the rails which didn't bode well. The windows were filthy and actually had cobwebs on them; the sills were covered in dirt. In the shower the water pressure was a trickle and therefore useless for washing a full head of long hair. The final straw was being woken by workmen in the morning. We would not recommend this hotel to our worst enemy. Our room was filthy, drapes hanging on few hooks, afraid they could fall on the floor. Bed cover had tears and holes. Bathrooms looks like something from a construction site. Never again will we stay in such a mess. "Nove piace and top staff"
Se arrived in the night and the staff help us to fine a dinner in a no t easy situation. The place is lovely. I don t give 5 star due to the not high level clean of the room. A special Tanja to the Young receptionist girl that helped us. stayed here as we were attending a party here so it was convenient. Staff were friendly and the location is nice with the river however Our room was not good, bath stained, toilet seat stained, The mattress on the bed was absolutely awful it was lumpy and sank in the middle, it definitely needed a new mattress and a bigger bed, it was probably the smallest bed we have ever slept in at a hotel.. talking of hotels it was more like a motel only it was way over priced for what little comforts you got, i did not sleep at all that night. breakfast at £10 each extra was not worthy of £10 more like £4, it was buffet style and not good, for £10 i expect a choice of eggs not just scrambled powder eggs, i expect someone to bring us toast not make it ourselves, we even had to make our own drinks from a machine... will NOT be staying here ever again. So I checked into the hotel around 10pm and was greeted by the very personable Maria, a lovely manner and very helpful. I stay in many many hotels and never write reviews but just the way this lovely lady checked me in and showed me the direction of the room and her very pleasant but professional approach made me want to write this. The hotel is ok and “safe” for a short stay - does need some money spending on it but the room I stayed in was fine. Message to management: Give Maria a raise, she is a credit to your business! Dear Tim Thank you for your response, we are glad that you enjoyed your stay and our front office staff specially Maria very helpful.